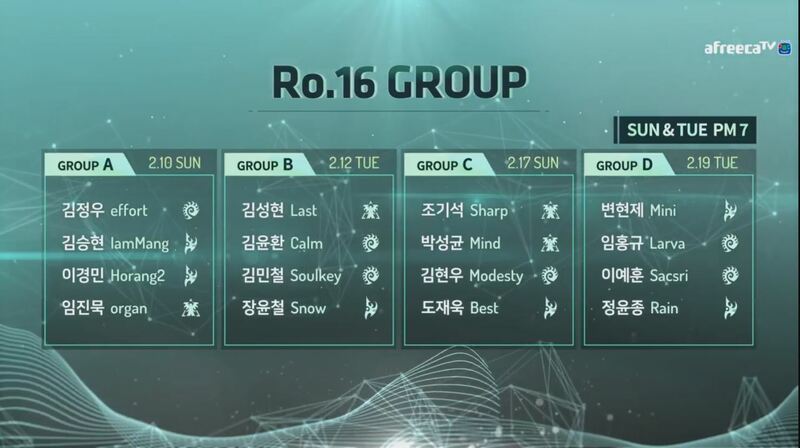 Group B looks quite interesting to me: The winners' match will almost certainly be Last vs SoulKey, but the loser of that match could get into trouble. Last could easily lose vs Snow, or SoulKey could lose vs Calm. Sacsri and Modesty are dead zergs. Mini really got the short end of the stick too. And one lower tier player will advance from Group A. I'm guessing Horang2. This is my signature. I love that I can have a signature here. I haven't had a signature since like 2008. It reminds me of the old internet. I wish I knew what to put here though. Great groups. It will be an awesome tournament. And don’t count Snow out. Snow barely lost to Jaedong in a recent tournament 2-3. Anything can happen in a bo1. Imo Mini has a chance against Larva and Rain if he doesn’t get nervous jitters. I totally agree with that post. Mini and Last arent safe bets. Guemchi is probably 2nd favorite in group A. Even if Sk should beat snow about ~65% of the time (imo), snow should get to ro8 anyway. Great groups. Group B is nasty. Group B: Snow, Last. Pulling for the upset from Snow. Group D: Rain and I like Larva's Beard. last only played 3 spon games total this month lol...his match fitness in severe question hes gonna fall prey to snow/calm's tricks. hopeful he can prove us wrong but they way things go i highly doubt it.. sk's skill and cerebral play makes him the tourney favorite. snow's trickery+blockchain should see him through. Best gets a favorable group this time (unlike asl5 where he loses to a toss dominated group). Sharp has more quality than the other 2, mind hasn't performed in quite a while and modesty is just a limited player. I think Larva has the quality to edge past Mini. Sascri isn't very convincing in his 2-0 win over a past it mong. Rain is in a league above the other 3 players. starting on sunday or we have to wait a little while? Starting next Sunday (10th), next week is the Lunar new year holiday so probably a bit awkward to start it then. He also has been losing left and right to Rain the last couple of months so that one will be an interesting group. Group B is great ! And in group C, Best should have no problems with two terrans. Then Last gets lucky and draws organ in ro.8, 3-0's BeSt in ro.4 and we get Last vs. Effort in the finals. Where can I find these games?